So, maybe I blew off running the Brooklyn Half on Saturday, but the weekend wasn't a total loss. If nothing else I took a lot of pictures, as you're about to see. Saturday afternoon, I took the train down to Philly (well, technically I took it to New Jersey) and met up with Liv. Our plan: eat some pizza, go to bed early, and run the Dirty German 25k trail race the next morning. I was skeptical about the pizza (let's just say... I've never heard of a good reason to go to Jersey, period, and food certainly wouldn't be my first thought). I wasn't skeptical about the race, though. Germans! And they're dirty! And it's a trail race! Trail races are a little different, aren't they? I was very curious about this race, and not just because they promised St. Pauli girls at the aid stations. 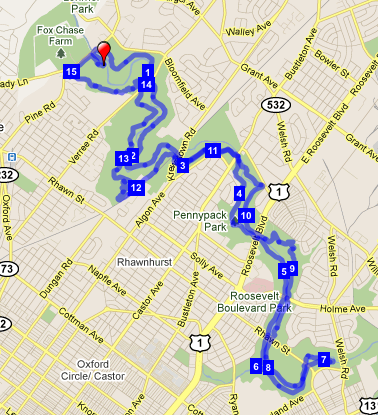 The race was held completely within Pennypack Park, a branch of Fairmount Park in the Northeast part of Philly. I'd never heard of Pennypack Park before, even though I lived (and ran) in Philly for several years. Would it actually be a trail race? Or would it be a sort of urban/trail hybrid? What, you can't tell that those are beer cans strewn about my feet? Oh, that's because it was so humid that the lens of my phone/camera would not defog. Also, I had asked a fellow racer to take this picture, and I think he took four or five different shots. This is the clearest of the bunch. The humidity followed Saturday's rain. I guess I'm glad it wasn't raining on race day, but the mud was pretty intense. Both Liv and I very nearly lost shoes to the suction of it. As promised, there were some sections of the course that were single track, including one interesting section of exceptional narrowness. The trail was only a few inches wide and the foliage was all up in our faces (literally). 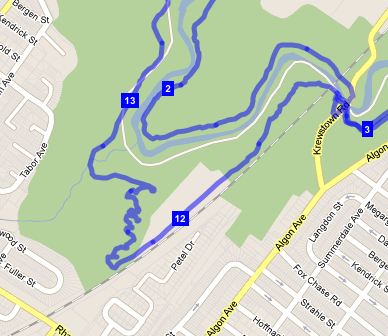 Do you see how the course goes all wavy? We were basically running s-shapes around and around... we could see the next runner ahead of us, but we could never quite catch up to him or tell how far ahead he was. It's fascinating to see how close we were to the train tracks and to houses, because you had no sense of that while out there. There were two stream crossings - nothing too deep and each fairly rocky, but it was hard to avoid getting your feet soaked. There were hills, but none too intense. And of course there were St. Pauli girls. That's coke, not beer, in my glass, sorry. Can you tell that my shirt is quite literally soaked through with sweat from the humidity? In terms of the running, the first 8 miles were solid and strong, given the trail terrain. After that, we slowed down some because an injury of Liv's flared up and she needed to take it easier. (I told her I was going to blame our slow down on her in the blog post, but in actuality I was happy to slow down, too.) That's the thing about a trail that's even a tiny bit technical, as I'm learning: pushing through and running isn't always that much faster than a fast walk. More than three hours after we started, we finished. They met us at the finish line (no more elaborate than the start!) and handed us our finisher prize pint glass - this race just kept getting better! When I saw the grill with all the bratwurst, I was in heaven. Assuming heaven is a sweaty, sweaty humid place with empty beer glasses and bratwurst for everyone, and assuming they'd let me in rocking a single arm warmer. Oh, and in case you're wondering? The pizza in Trenton really was that good. Who knew? LOVE that shirt! Sounds like a fantastic race - absolutely awesome. And you and your secret races! That would have been such an important fact to know for the poll!!! Fun!!! That lady looks real Jersey. Reeeaaaalll Jersey. Oh, and caginess accusation: redacted. Did you wear trail shoes or street shoes? I have never tried trail shoes but would like to someday! Road shoes! That I promptly threw out after the race. (I guess I could have cleaned them off, but I'd chosen them because they were at the end of their life.) I've wondered about trail shoes, but I just don't do trails often enough to justify it, I think. I hate the thought of the poor shoes just hanging out and losing their, um, foaminess while sitting unworn.